Keepin' on keepin' on with the craft beer club. We're down to stuff that I left to the end because they're all styles I generally avoid. This one's from a South Carolina brewery with a name I'm a bit confused by. The owner/founder/head brewer goes by Mark, not R.J. And his last name is Johnson, not Rockers. Rockers would be a tough name to live up to, wouldn't it? You have to constantly be rocking out or else people would be disappointed in you. I've already presented my views on brown ales, so I won't go over them again. The color and the smell both resemble a light porter- less dark, less opaque, similar roasty chocolate and coffee but, well, lighter. I also get a bit of hop scent in there, which is a nice feature because such things frequently get lost in brown ales. This is definitely the best brown ale I've had in the last three months. I'm honestly surprised by the fact that I actually enjoy it a little bit. I think it's because it tastes like a light porter too- the roasty flavors prevail over just basic malt. It's nice and dry up front, it's well-balanced, and there's a touch of hop bitterness that adds an extra layer. The only thing I find a bit flawed is that the finish turns a bit sweet and mouth-coating. Well, alright, I guess the stuff I left to the end didn't start off too badly. Probably not something I'd buy, but for the brown ale style I didn't mind it too much. Nice job, R.J., whoever you are. P.S. 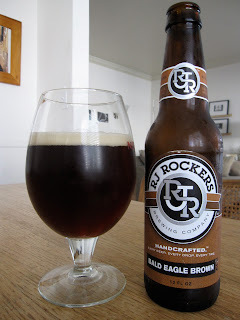 I should mention that the craft beer club sent me some of R.J. Rockers' Patriot Pale Ale along with the Bald Eagle. It was quite delicious, another sterling example of beer-flavored beer. But I managed to drink the one I was saving for the review during a semi-drunken fridge raid. Sorry about that, R.J.
No matter how hard he tried, RJ just couldn't replicate the aromas of freedom.